Ss. Peter & Paul, Scarning has a fine ring of six bells, the tenor weighing 14 cwt. They produce a mellow sound, but with plenty of volume and lend themselves best to being rung at a sedate pace. The ringing is at ground floor level and the base of the tower is fully open to the nave of the church. This is appreciated by congregations, who enjoy seeing the ringing taking place. Bearing in mind the long draft and the weight of the bells it takes confidence and concentration to ring methods accurately but the sound produced well repays the effort. The church was entirely built in the 15th century, though not all at the same time, the tower being constructed last. An inventory carried out in 1553 records that there were three bells, plus a ‘sacring’ (sanctus) bell. The medieval sanctus bell still exists and is worth looking at if you visit the church. Five new bells were cast at the end of the following century but it is not known for certain what happened in the meantime. One account says that the original three were still there and were broken up to provide metal for the new ring of five, but it is also possible that they were removed and sold much earlier, as happened frequently at the time of the Reformation. 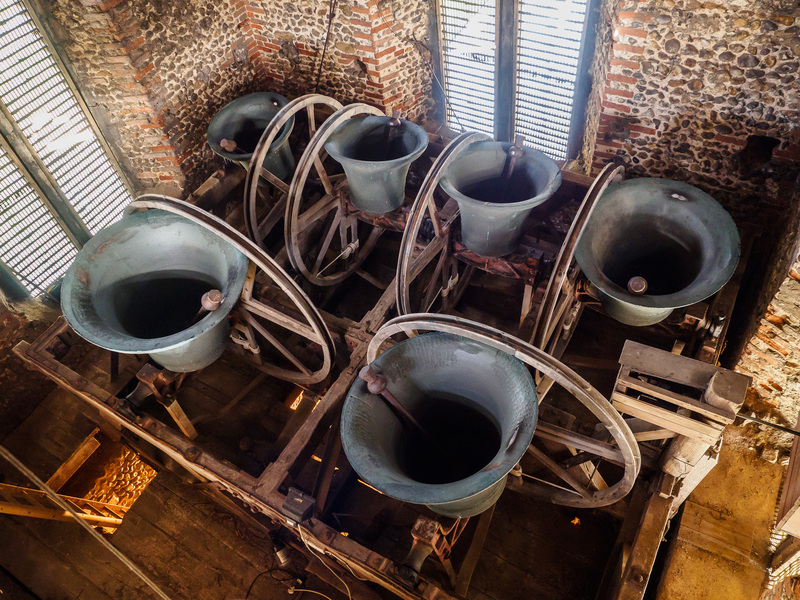 The five new bells were cast by Charles Newman, the tenor in 1703, probably at Horstead, and the others in 1697, probably at Blakeney. Most of Charles Newman’s bells that survive exist as singles and a complete set of five is rare, so Scarning should consider itself fortunate to have these. There were extensive alterations and restoration in the church in the 1850s, carried out by Thomas Jekyll, but nothing of significance was done to the tower until Augustus Jessop financed its restoration in 1894. However, at some point, probably the second half of the nineteenth century, a new bell frame was installed with room for six bells. Throughout this period the tower had its ring of five Newman bells and it was not until 1931 that a new 5 cwt. treble was added by Gillett and Johnston, who at the same time rehung the bells in the existing frame. The Gillett & Johnston treble is in the foreground. The inscription reads ‘The Jesus Bell’. During the latter part of the 20th century there was no regular band of ringers at Scarning and things went into a decline. 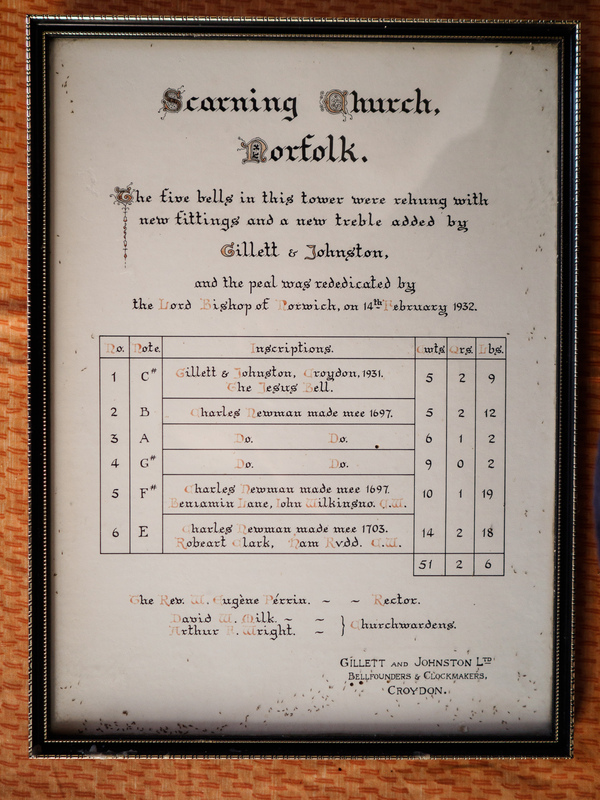 When ringing was specifically requested such as for a wedding, volunteers would come from Dereham and elsewhere, clear the clutter from the ringing chamber and do their best. It was not until 2009 that two retired couples in the village decided they would learn to ring, and with tuition at Dereham and Gressenhall, did just that. Thanks to their enthusiasm the ‘Scarning Four’, as they became known, formed the nucleus of what has now become an autonomous band of Scarning ringers, numbering ten and almost all living in the parish. The legacy of close cooperation with the St. Nicholas ringers at Dereham has been maintained and there is a constant to and fro of ringers between the two towers. When Frank, Tricia, John and Trish started, the bells had a reputation for being difficult, and it was the sort of tower where people would say ‘if you can ring here you’ll be able to ring anywhere’. However, the fitting of new ropes which were less stretchy than the old ones and the simple fact of ringing week-in-week-out, have made a big difference, and the general opinion now is that they go far better than they did when regular ringing recommenced. 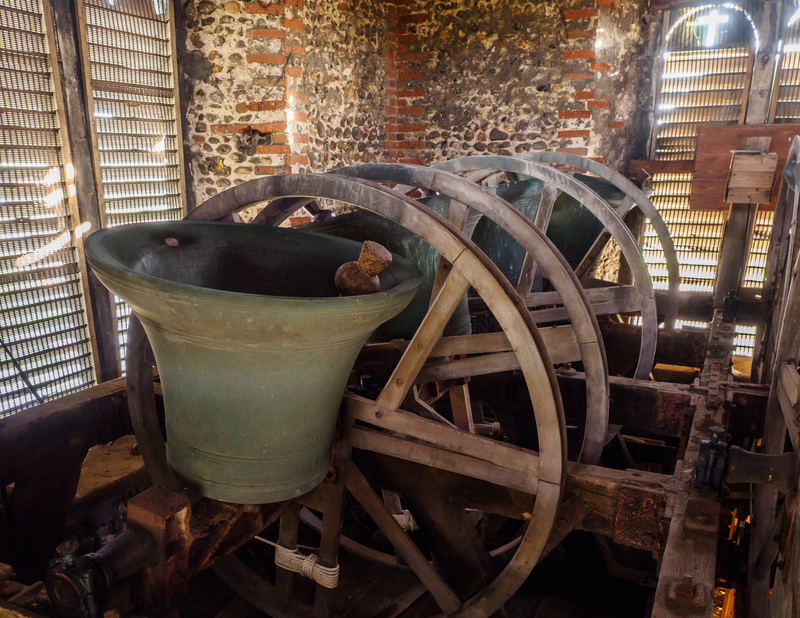 You can watch a video of the bells being rung and the bells themselves in action. Just click the link in the sidebar.